You borrow a dollar and show a Sharpie(R) marker. Tell the owner of the dollar to keep her eye on the money and not the pen. Instantly, you uncap the pen with one hand! Then you tap her bill twice with the pen and show her that a mustache has appeared on George's picture! While she holds the pen, you begin to fold the dollar and ask her to cap the pen. The moment she does, the dollar visibly changes into a brightly colored note! As you unfold it, it says, "Ready?" "Okay, then..." "Please Uncap the pen." When she does, she finds her dollar inside! There's George, mustache and all! WARNING: This effect will induce spontaneous profanity! When you order "Stash" from us you get the specially modified Sharpie(R) that automatically changes in the spectator's hands, a "quick release" tool for resetting the pen, a perfectly pre-folded note ready to use, and a link to Harlan's video demonstrating how to prepare and use everything. 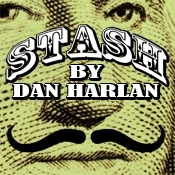 Although "Stash" is designed for U.S. currency, the instructional video also contains variations and ideas that don't require a dollar. We're so excited by "Stash" that we know you're gonna love it!